Linear-Phase vs. Regular EQ: Which is Better? 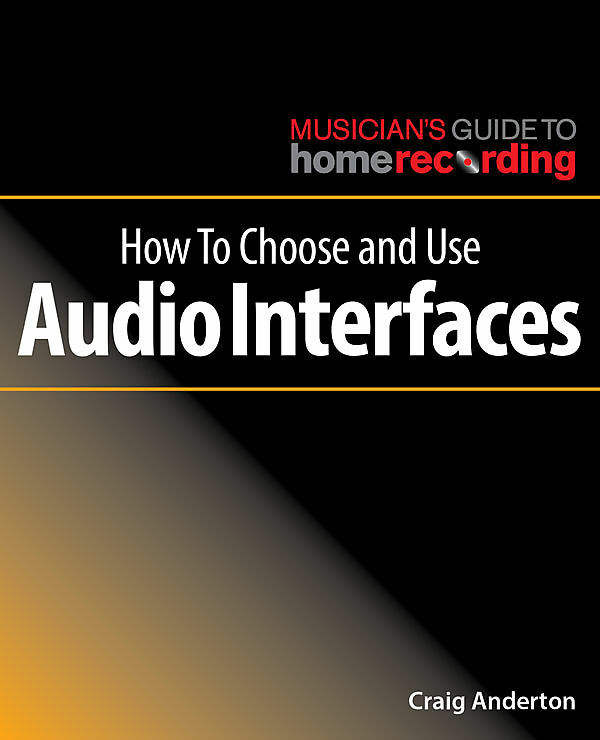 Editor's note: The following has been excerpted from Craig Anderton's book How to Apply Equalization, from Hal Leonard's 12-part Musician's Guide to Home Recording book series. You can order the ebook here or the softcover from Hal Leonard. There are two broad categories of equalization: non-linear and linear-phase. Each has advantages and disadvantages. Some equalizers offer both modes so you can use whichever is best for a particular application. A lot of mythology surrounds this issue, and the following is a bit technical. The key takeaway is that linear-phase equalization is more precise, but it tends to have less character then traditional EQ. Linear-phase equalization isn’t as common, but it can offer significant advantages in some situations so it’s worth investigating what it can do. One potentially significant difference is CPU load. Linear-phase equalizers tend to draw more power than non-linear EQs. However, the CPU requirements vary—for example, the FabFilter Pro Q 2 equalizer has a variation on linear-phase operation that draws less CPU power than traditional linear-phase types. Linear-phase operation may also be offered at different degrees of precision (low, medium, high), with more precision drawing greater CPU power (Fig. 1). Some EQ processors offer a draft mode, which uses less CPU power, and can change to maximum precision when mixing. 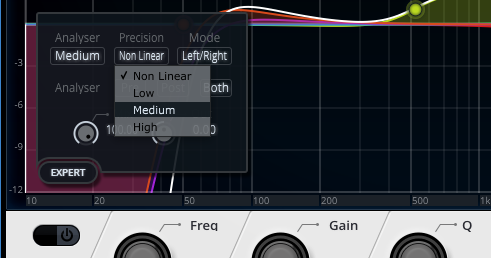 Figure 1 Clicking on the Cakewalk L-Phase Equalizer’s Expert button brings up a dialog box where among other functions, you can choose non-linear mode and three different degrees of precision for linear-phase mode. Many other EQs work similarly. Traditional EQs that are based on analog equalizers introduce phase shifts when you boost or cut a band. A phase shift alters the waveform subtly and while you can’t hear this alteration by itself, you may hear it when combining bands that have some degree of phase shift. It’s hard to describe the resulting effect, but it can lead to a somewhat less distinct sound. Some people call this smearing, which may be subtle or obvious, depending on the settings. However, note that these phase shifts are also what give particular EQs their character and are therefore sometimes desirable. Latency is the name given to delay caused by processing within the computer, which is most noticeable when monitoring an instrument played in real time through the computer—like a guitar going through an amp sim or a keyboard triggering a synthesizer plugin. Longer latencies mean that it can take several milliseconds—and under some conditions, much longer—between the time when you pluck a string or hit a key on a keyboard and when you actually hear the note. Various plugins can add to the overall latency. Linear-phase processors, some dynamics processors, and convolution reverbs are particularly prone to adding latency. Linear-phase EQ delays the signal, which is necessary to make sure that the equalizer can ensure all bands are in-phase to avoid introducing phase shifts. This allows for extremely accurate and predictable equalization. Some people even refer to linear-phase EQ as surgical EQ because of its precision. If you compare non-linear and phase-linear modes with a massive treble boost, you’ll almost certainly hear that the linear-phase processed audio sounds more transparent and airy. Conversely, the phase shifts that are an inherent part of non-linear equalization can give a particular character you may find desirable for some individual tracks or even entire mixes. But also note that linear-phase equalizers aren’t perfect. Because they need to delay the signal, your host recording software needs to delay all your other tracks to match the amount of delay. Otherwise, the tracks being processed with linear-phase equalization would sound late compared to the rest of the tracks. In addition to increased latency because linear-phase EQs need to delay the signal, they can exhibit a phenomenon called pre-ringing that’s inherent in phase-linear operation. This can be heard as a low-level, swooshing artifact before transients. Normally pre-ringing isn’t an issue, because it becomes audible only at relatively low frequencies with high gain and Q (width) settings. However with hip-hop, electronic dance music (EDM), and other bass-heavy musical genres, you may want to add high gain/high Q settings at low frequencies on specific tracks or even on a master; a linear-phase EQ may not be the best choice in this case. Conversely, non-linear EQs can exhibit a phenomenon called post-ringing with transients. This tends not to be noticeable because it’s masked by the audio that follows a transient, but it exists. Neither pre-ringing nor post-ringing are deal-breakers at all, because they tend to matter only at relatively extreme settings. But, it’s good to understand the phenomenon so you can choose the appropriate EQ response. Please refer to Fig. 2, which shows kick drum pre-ringing with high-gain, narrow-width settings. However, note that it’s zoomed way in vertically so you can actually see the low-level pre-ringing (this is why the kick appears clipped, even though it isn’t). Figure 2 Pre-ringing is noticeable at extreme settings: a non-linear EQ (top) shows no pre-ringing, a moderate-gain linear-phase EQ (middle) shows low-level pre-ringing, and a high-gain linear-phase EQ (bottom) shows obvious pre-ringing. The green kick drum waveform in Fig 2 (top) has a gain of 10 dB and Q of 10, but uses traditional, nonlinear equalization. There’s no pre-ringing prior to the attack—the waveform is a flat line right up until the attack. 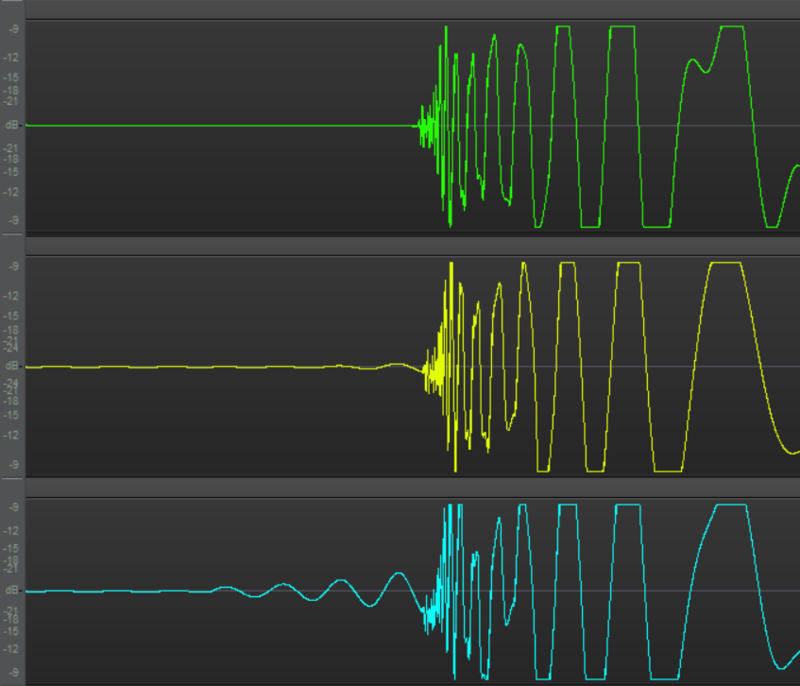 The yellow kick drum waveform (middle) uses linear-phase EQ with a gain of 5 dB and a Q of 5, at 100 Hz. You can see a tiny bit of pre-ringing as a slight ripple in the wave just before the attack. The blue kick drum waveform (bottom) shows the same kick through a linear-phase equalizer, also with a boost at 100 Hz. But this time the gain is doubled to 10 dB and the width is narrowed to 10. At this relatively extreme low frequency setting, the wavy line before the attack is obvious; listening to this, you’d hear a swooshing sound preceding the attack. In most applications, pre-ringing will not be an issue, and may not even be audible. But if it becomes problematic, you can always use a non-linear equalizer instead of a linear-phase one. One issue that confuses some people is a recording system that suddenly exhibits increased latency. Although a misadjusted audio interface parameter can cause latency, note that many plugins introduce latency—not just linear-phase equalizers. In particular, some dynamics processors introduce latency on purpose with a look-ahead buffer. This delays the incoming audio long enough so that the processor can analyze a signal prior to processing it. Although you may have an option to choose a setting that reduces latency, linear-phase equalizers will always exhibit some degree of latency. Non-linear operation has no equivalent limitation, so if you want to use EQ while tracking and need minimum latency, you can use the non-linear setting and then switch over to linear-phase operation when mixing, where you won’t really notice the increased latency. Most DAWs also let you freeze tracks (i.e., render an audio version of the track with processing so the signal doesn’t have to pass through the processor in real time) to minimize CPU consumption. Comparing linear-phase and non-linear modes, I’d say their personalities are audibly (albeit subtly) different. Non-linear mode adds a bit of an upper midrange edge, whereas linear-phase operation is more neutral in how it affects the sound. Also, for a given amount of gain, linear-phase mode will sound like it has less of an effect because its sound is more transparent. But to put matters in perspective, the music itself is infinitely more important than the EQ mode. Linearphase operation has its uses—but if only traditional EQ existed, the earth would continue to rotate on its axis.